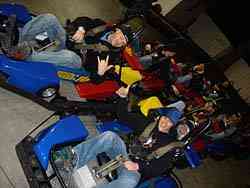 Fast Eddies Fun Center became the place where JR Norris became a legend - in his own mind. He went from being dumped by good friend and teammate in Sunday’s Snowball Derby Steven Wallace in a heat race to beating his buddies Wallace and Jason Hogan in the biggest little race of the Snowball weekend, the Snowball Showdown go-kart race at Fast Eddies Fun Center in Pensacola Friday night. Plenty of contact occurred throughout the early practice and qualifying rounds between Hogan and Norris set the table for fireworks in the Fast Eddie’s feature events. In the Snowball Driver’s Challenge race held just for the drivers in this weekend’s Late Model events at the Snowball Derby, Hogan was spun out on the first lap by Norris, forcing verbal haymakers to be thrown on both sides. After the race, an elated Norris had a hard time balancing his swelled head with the big race purse and even bigger winner’s trophy, a trophy that was nearly as tall as he is. “I’m not sure if this makes me the greatest race car driver of all time or not, but it’s got to put me pretty high up there,” said Norris. “I just tried to play my race strategy to keep away from the guys who were doing a lot of beating and banging. Perhaps Hogan deserved the wrecking he got from Norris. Before the drop of the green flag, Hogan was mysteriously tinkering with the right front tire of his kart. Cheating? Perhaps, but Hogan saw it all as a safety precaution. “I was making sure the lugs on the right front tire were good and tight because I don’t want to wreck out there,” said Hogan with a sly smile. Norris didn’t care about his toughest rival taking the race into his own hands. Instead he checked out Hogan and everyone else in the Snowball Challenge race. 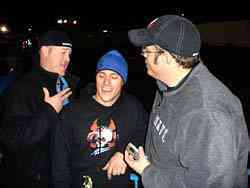 Matt Kentfield (right) interviews race winner JR Norris (center) while Jason Hogan (left) shows his displeasure. Norris had to win through his own controversy in the Shootout, but when all the drivers entered in this weekend’s Snowball Derby event at Five Flags Speedway hit the track for the Driver’s Challenge race earlier in the night, controversy made itself. Brandon Carlson led the final half of the Driver’s Challenge, but his car number was never shown on the scoreboard as the race leader. Turns out the driver was disqualified from scoring due to the fact that he’s had about a zillion laps on the track in his career because his father, Florida Late Model veteran Scott Carlson, is the owner of Fast Eddies. Justin Drawdy followed Carlson across the line but was the one who took home the race win. "Right before the race started somebody threw me some funny glasses,” said Dillner. “I put them on, could barely see, but I guess helped me get to the front. It was nice to win a race especially having the 51 boys helping me out on track. I think I may sleep with the trophy tonight!" That race was also marred with controversy. With only five cars on the track, therefore guaranteeing a top-five finish for all of those involved, Dillner paid off his Speed51.com teammates Matt Kentfield and Jeremy Troiano to becoming “blockers.” As the race progressed, the two Speed51 teammates weaved to block the leader, a local radio station personality, allowing Dillner to catch up and eventually pass the leader in the last lap. In all, it was a good night at Fast Eddies with a lot of hard racing, a lot of fun and some good money raised for a good cause. 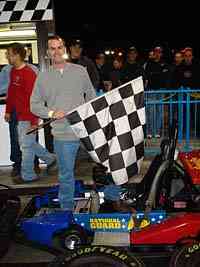 Justin Drawdy won the Snowball drivers race at Fast Eddies. Carlson took the DQ like a slap across the face in front of all his friends at his home track. Just the opposite emotion from Carlson’s was that of Speed51’s own Matthew Dillner. Dillner was all smiles after his hard fought checkered flag in the Media race that started the night off, even if he could barely see where he was going.